I’m definitely not a farmer, even though I live on a farm. However, I think I have an instinct for this country thing. A week ago I was showing you photos of hay growing in the field and saying that I thought harvest was imminent. It turns out, I was right! Last Friday night I came home from work to see that all of the fields had been mowed. Here’s the scene from the big field, which you saw last week. 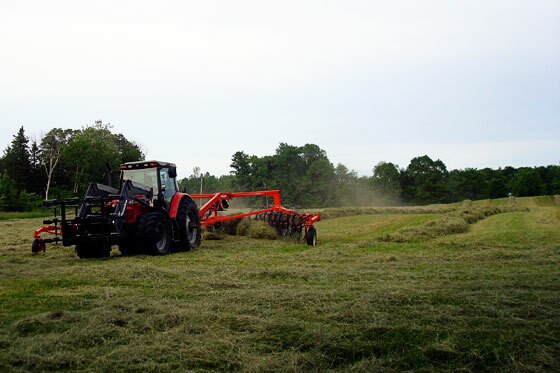 Saturday work began to get the hay out of the fields and into a more useable form. First step is drying the hay. This tractor came through around midday and “stirred” the hay. 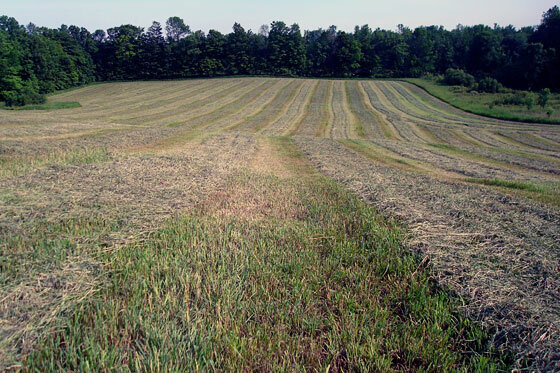 In my ongoing attempts to show you as much of the farm as possible, I took pictures of each haying stage in different fields. This is the “field behind the drive shed” (official name). After this, the hay was strewn all over the field. Good for drying. Not so good for baling. Early evening, this tractor (and the really cool pinwheel attachment he’s towing) combed the hay into long mounds. Now we’re in the front field. I thought we might be done for the day, but nope. (Maybe my instincts aren’t so good). A little while later, the baler showed up. 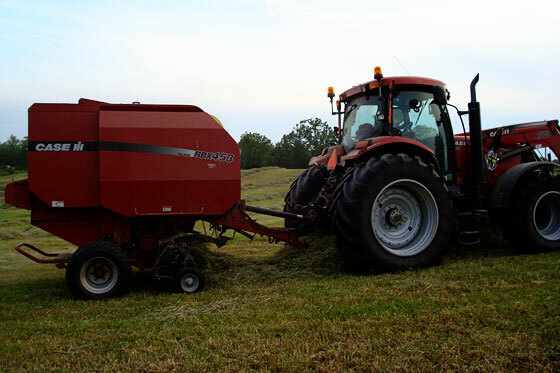 The baler scoops up the hay and little elves inside that big red box spin it into a huge bale. (What do you think about my farming know-how now?) My sense of direction is still working though. We’re now in the corner field. Once the elves are done their work, they wrap the bale in a web of green mesh, and then the magic door opens and the baler spits out the bale. These round hay bales are huge up close. They’re about 5 feet in diameter and really, really solid. And when they first come out of the baler, they’re warm too! (We’re still in the corner field). 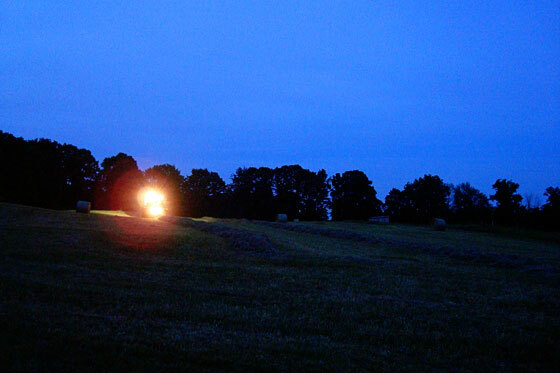 By Sunday morning, we had five fields full of big round hay bales. 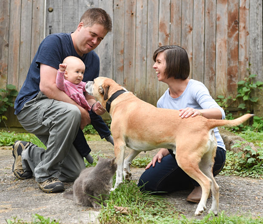 (We actually have six fields total, but one–the far front field–is in rehab, so nothing’s growing there this year). Here’s the scene from the back field. Baling lasted well beyond sunset. We’re back in the field behind the drive shed now. Perhaps our farmer’s instincts are better than mine though. 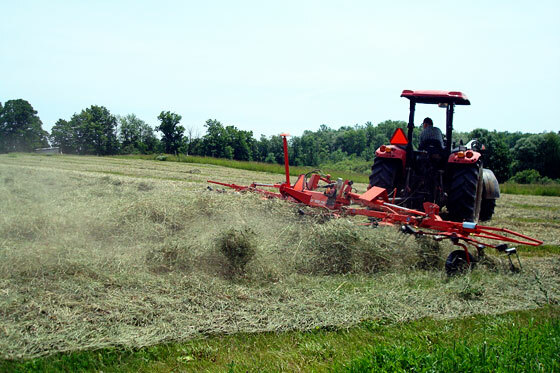 When I would have quit and come back tomorrow for baling, he finished it all in one night. And early Sunday morning when the rain started, the hay was tucked nice and tight in its bales, protected from the precipitation. One thing I do know about farming is it’s incredibly hard work. I’m happy to enjoy the sights of the harvest from the side of the field. 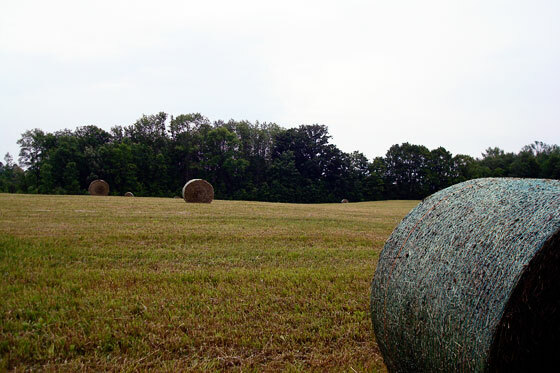 I’m a HUGE fan of the circular bales – they are so photogenic, don’t you think? 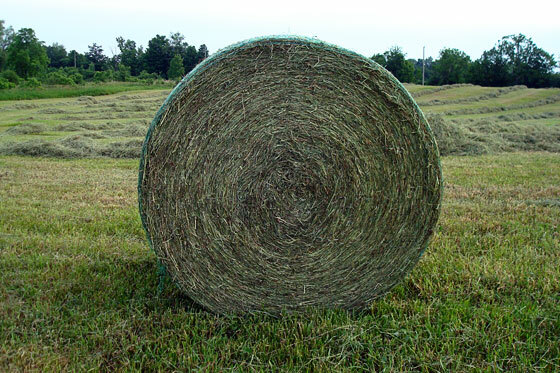 In California, we rarely see the rolled bales – just the smaller cubed bales. Seeing the bales sitting in the fields was definitely a great sight. Interesting that the round bales aren’t as popular out where you are, Michele. I didn’t realize they were geographically specific. I see them once in awhile here, just not that often. I have no idea why. 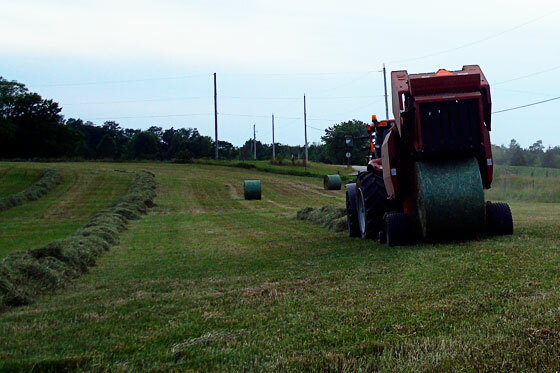 After some internet research – it looks like round bales are not easy to transport so usually farmers who grow their own hay for feed would utilize the round bales. So, maybe cattle ranchers in California don’t tend to grow their own hay – land being at a premium and all. Thanks for the info, Michele. I haven’t seen how my farmer transports the bales yet. Now I’m curious! In Alberta, they’ve almost entirely switched over to the round bales. And I often have seen them working by tractor light, too. It’s interesting to compare it with the descriptions in the Little House series of books, where they would work for days on end, and the women would have to work just as hard in the kitchen to feed the whole crew of hungry threshers. Even with tractors and trailers and all of the other equipment it still seems like very hard work. And very long days.